In a large saucepan, over low heat, melt butter and cook leeks for 10 minutes. Cover pan and stir often. Do not brown leeks. Add water, broth and potatoes. Cook for 20 minutes covered until potatoes are tender. Place soup mixture in blender and blend until smooth. Run through a strainer and place strained soup back into the saucepan. Heat soup over medium heat, add salt to taste. To serve, garnish with fresh parsley, fried onions and fresh cracked pepper. Blend half soup mixture and omit straining the soup for a delicious chunky potato leek soup. 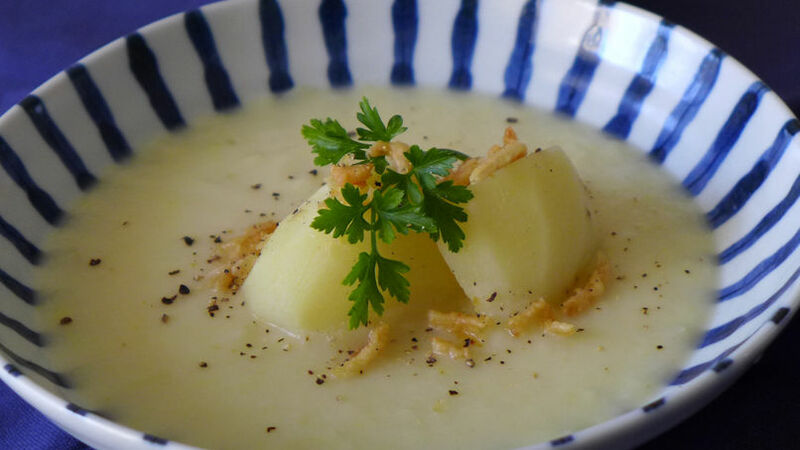 The cool weather is just around the corner and we like to welcome it with a piping hot bowl of potato leek soup. Made in just under 40 minutes, this creamy and hearty soup is a favorite among kids and is the perfect meal solution for a weekday dinner.